← Can the ICC Deliver Impartial Justice? “It is with much regret that we announce that Radio Netherlands Worldwide (RNW) has decided to stop publishing the International Justice Tribune (IJT). We believe this coverage is both essential and complementary to the work of our core readership, composed of researchers, lawyers, journalists, political decision makers and human rights activists at national and international levels. We believe a rigorous and independent specialised newspaper is not only useful, but a condition for the healthy development of international justice. The steady increase in IJT’s readership over the years is proof of the needs it fulfils. We believe that a free specialised press is essential to the main actors in the area of international justice both here and in the affected countries. For these reasons we, the IJT’s editors, are now committed to seeking an imminent and sustainable solution for this non-costly project to survive in its present form. We would like to respectfully ask you to fill in our online petition and send us reasonable suggestions on urgent or long-term financial support. Sign the petition and help save IJT! This entry was posted in Advocacy, JiC News. Bookmark the permalink. 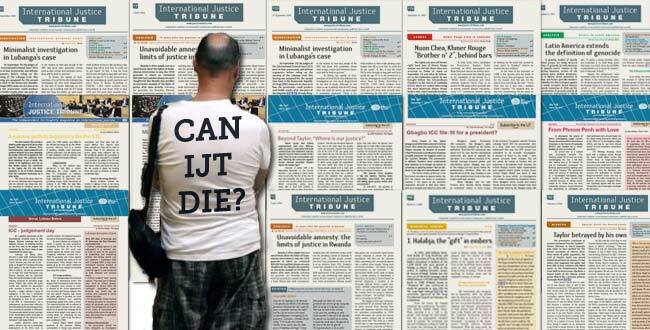 2 Responses to Can International Justice Tribune Die? No! Very sad. Reminds me of the Hague Justice Portal that stopped running at the end of 2011. I have added my name to the petition. The work of IJT is great, to say the least. Thanks for spreading the news and I hope our voices count. That’s great Andrew! I wholeheartedly join you in hoping our voices count and that the campaign to save IJT is ultimately successful.